Children at Risk and Quickstart Autism are having a casino-night fundraiser on New Year's Eve. It's at the Ottawa Conference and Event Centre. The reception starts at 6:30 and dinner starts at 7:30. There are reduced rates at the hotel if people want to book overnight. I feel a little awkward about this but I'm going to put it out there. This is the season when people decide to make donations to various charities. If you know anyone who is looking for an opportunity to really help, please pass this post on to them. We've been raising money for my son, Alex, to have an autism service dog. We've been asked to raise $ 30 000, of which we have raised $ 13, 500. With a dog, our family could do more things together as a unit, like go to the grocery store or out to the park. Alex would have the opportunity for more independence and he would have a companion. We can tell that he's lonely since he's developmentally far behind his peers and too large and excitable to play with kids at his own developmental level. The dogs are provided by National Service Dogs in Cambridge, Ontario. They do not charge the families (we'll receive the dog regardless of how much money we raise) but depend entirely on donations. If we can raise the $ 30 000, then another family will be able to receive a dog and gain their own independence. The money covers the intensive two year training process which make these animals such valuable companions. Alex is the only child in Ottawa currently on the waitlist for a dog. 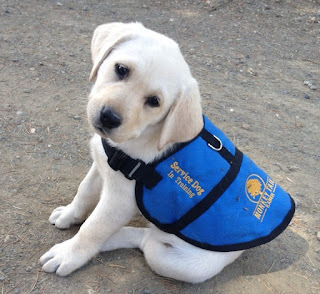 You can donate online directly to National Service Dogs in Alex's name here. Our friends and family have already been incredibly generous. We can't thank them enough for all of their support. Every little bit helps get Alex just a little closer to meeting his new best friend. Last week we had our Parent Teacher Interviews for both kids. And for once, we're not dealing with any crises (knock on wood). Alex is settling back into full days at school and they tell us he's one of the best behaved kids in the class. He's been integrated with a regular Grade 6 Core French class once a week and seems to be doing well. They've considered other options but he's far ahead of his peers in math and far behind in English. In the spring, they'll consider having him join the choir as they practice for the spring play. Next year is still in doubt. We won't know where Alex is going until June. The expectation is that he'll be in a new autism program at our local high school but we won't know if that program has been approved until June. Nathan is also doing well, despite not having an aide this year. His teacher tells me that he's doing much better at focusing and settling into his work. There are still times he's distracted but she's teaching him how to manage that himself (like sitting in a corner desk if kids are playing on the computer while he's trying to work). She thinks he might do better if he had a laptop to type on instead of writing by hand, so she's put in a request to the Board. We'll see what happens. It's nice to know they're both doing well and controlling any impulsive or aggressive behaviour. It lets us concentrate on other issues. Most parents, when they get the field trip forms, get to decide: do I want to go along on this or not. I usually have a note attached asking me to come along and manage Nathan. So I've been on every field trip for junior kindergarten, senior kindergarten, grade one and grade two. We recently got a permission form for the next field trip and to my surprise, I didn't have a note suggesting compulsory attendance. Which was good since I have two meetings at work on that day, and while I know my bosses would be accommodating, I didn't want to have to ask for more favours. They're giving it a try to see if Nathan does all right with a non-me volunteer. If this is the case, I will then have the same choice as all the other parents. On the one hand, it's been nice getting to participate in all these extracurricular activities. On the other, it's going to be nice to have the option of not-participating sometimes. Yesterday, Nathan got sick with a bad cold. He's still home sick today. When Alex realized Nathan wasn't going to school, he told me "Alex sick. Alex stay home." I dutifully felt his forehead, took his temperature, and listened to his breathing. All perfectly normal. No fever, no cough. His appetite and energy levels are good. So, despite my general policy of always believing my children ... this time, I must decline. On Monday, I wrote about Nathan's big morning tantrum but didn't have time to talk about how I dealt with it. I've gotten a couple of questions, so I thought I'd go over it. Nathan has always needed some time to wake up. Normally, it's not a problem because he wakes up earlier than everyone else and he can take the 20-30 minutes to gradually become alert. Then he's a bouncy, cheery morning person. When I saw he was still asleep, I knew I had to go slowly. The best technique is to gently touch his feet or hands, which starts to bring him up out of sleep. Then I have to keep doing it at irregular intervals to stop him from falling back asleep. I can't talk to him, can't make a joke or do anything too obvious that I'm waking him up. On Monday, as soon as I touched him, he began to growl and scream at me. So I knew: not good. At that point, I've lost the waking-up-with-a-modicum-of-cheer battle but I can't afford to lose the entire waking-up war. I had to keep on preventing him from falling back asleep, which kept triggering new screams, throwing things and growling. I had a real dilemma. When we have a bad wake-up like this, it often means a very bad day. Should I send him to school and risk a major set-back to our good progress? What would I do with him if he stayed home (need to not reinforce this behaviour by letting him have a fun day playing at home)? How far do I push him? After forty minutes, I had real concerns that we didn't have time to get ready for school. Do I force him to get dressed and carry him kicking and screaming to the school ground? I decided that he had ten more minutes before I'd have to force the issue. Luckily he managed to calm down enough to be able to speak. He asked to go back to sleep and I told him there was no more time. I also warned him that there wasn't going to be time to play, that he'd used it all up having his tantrum. He started to complain that was unfair, I cut him off and told him I wasn't listening to it. That he'd made a choice to throw a tantrum rather than tell me what the problem was. We got him to school and the teacher said he had a quiet day but an okay one. Quickstart has arranged for visiting times with the Santas at local malls for kids with autism. It's before the mall officially opens, so it will be quiet and there won't be much of a wait. Santa will also have been briefed on dealing with children with autism. Carlingwood and Rideau have times posted in November, while St. Laurent and Hazeldean are to be confirmed for December times. This morning, Nathan didn't want to wake up. From the look of his room, he woke up sometime in the night and began to read (I'm surprised I didn't hear him as he usually likes to make sound effects as he reads). From how tired he was, I'm guessing 2-3 hours of lost sleep. It took 45 minutes of tantrums to get him out of bed. Which has left everything else this morning short-changed and rushed. Including blogging (sorry). Nathan hasn't been feeding me as many good lines of late but yesterday he gave me a doozy. We were sitting and watching a funny cat video on YouTube when Nathan announced: "That's loyal." Me: Nathan, that's L-O-L, it means laugh out loud. At which point I lost all parental credibility in a fit of laughing. For once, our kid isn't on the "aggressor" end of a school incident report. Earlier this week, we were notified that one of the other children in Alex's class had bitten him while they were sitting in circle. The teachers let us know that Alex did nothing to provoke the incident but they were proud of how he handled it. Rather than hitting the child back, Alex immediately jumped up and shouted "No biting!" before moving to an empty seat on the other side of the circle. So he alerted the teachers and removed himself from the situation, which is exactly what we would want him to do. He wasn't hurt. I would guess that the biter mostly got a mouthful of his sleeve. But it's put me in a position I haven't really been in before: the parent whose kid could have been hurt by the aggressive acts of another child. As I mentioned before, I'm usually on the other side of the equation. It's left me wondering. Does the child bite his/her parents or siblings at home? Is this a surprise to them? Was she acting out a routine or was this intended to gain attention or an attempt to deal with some sensory issue? Where most parents jump on the warpath when their child is hurt, I think I have more compassion. I understand how even the best intentioned and careful parents can be helpless to entirely prevent these behaviours. This isn't a malicious attack or a case of bullying or even neglectful parenting. I'm sure it's something they are working on and I'm sure they feel just as horribly guilty as I always felt when Alex hurt someone else. Parenting isn't a guaranteed success. It's not like cross-stitch or knitting where if one pays attention and puts in the work, the result is as promised on the front of the box. Sometimes we can be doing everything humanly possible and a few things which aren't and still it will not be enough. I've faced the screaming parents accusing me of being a monster, raising a monster and all the variations within. As if I deliberately chose for their child to be hurt. I've blocked the ones who tried to inflict a little eye-for-an-eye on Alex. And I've lost my temper and hurled a few accusations of my own. It did nothing to help the situation but it did show Alex that I believe he is worth protecting, even if he has done something wrong. It shows him that he is not abandoned because of his actions. I'm his mother and nothing will ever change that, no matter how horrible I feel about any harm he has inflicted. A work colleague sent me a link to this article from Psychology Today which blames all of societies' ills on screentime. As you may guess from my introduction, I am not convinced and am actually rather annoyed by the irresponsible representation. First of all, any solution which suggests that there is only a single cause to multiple issues gets an automatic red-alert wishful-thinking alarm from me. Second, the article uses a lot of alarmist language but not a lot of actual explanation or scientific backing up. Some of what they talk about does have valid points but the whole thing strikes me as overly dramatic and intended to start parenting panic. 1) Screen time disrupts sleep and desynchronizes the body clock. This is based in truth. Any light after dark disrupts the natural sleep rhythm and body clock, which means that this has been a problem since humans first figured out fire. 2) Screen time desensitizes the reward system. Again a nugget of truth that the rapid fire succession of images sets up a trance state which feels relaxing and good. However, the assertion that this somehow destroys the capacity to ever concentrate or function is absurd. 3) Screen time produces light at night. Same point as number 1 but dressed up in slightly different clothing. 4) Screen time produces stress reactions. They don't even try to explain this one but instead talk about how high levels of stress can create problems. There's no mention of how screen time creates a stressful situation. 5) Screen time overloads the sensory system. Again, no tie in with screen time but the section talks about how poor focus can make it difficult to control impulses or cope with unexpected changes. 6) Screen time reduces physical activity. Well, duh. That's a valid issue to be concerned about but it's not a catastrophic one. I know from my own experience and watching my children that screen time hypes us up but is also paradoxically soothing. I've talked about the challenges I have in managing screen time and how it is the cause of major tantrums. That's consistent with it being a major reinforcer. However, to suggest that it is the root of all evil rather misses the point. It needs to be managed and controlled but I believe our lives would be significantly poorer if we got rid of it. Screen time is story time, whether it's video games, movies, television, or YouTube clips. It may not always be awesome and uplifting stories, but life isn't like that. By sharing in bits of different experiences, my kids and I can move beyond our own limited corner of the world. Anything which encourages its participants to broaden their thinking and open their minds can be a good thing. Yesterday I took Nathan to get his flu shot. It turned into a very loud, very embarrassing procedure. I knew he was nervous so I did what I could to increase the odds. I took him out of school so that there would be fewer people and I wouldn't have to bring Alex with us. I promised him a doughnut if he behaved with dignity. I showed him video of other children getting injections (and not screaming). I talked to him about how important it was to tell me if he was afraid rather than throwing a tantrum, which he promised to do. As soon as he saw the needle, he began to shriek that we were going to kill him and that he didn't want it. I held him still and the nurse did it quickly but it was loud enough to make my ears ring. On the one hand, I as a parent wanted to comfort my obviously terrified child. On the other, I was embarrassed that he was so disruptive (he sparked a wave of crying and terror in the other children waiting). I was frustrated that this was happening despite my precautions. I was disappointed he'd broken his promise to talk to me instead of screaming. I'm not sure if I'm expecting too much of him developmentally. I don't know if there's a moment where the fear can be staved off and redirected or if it just swamps him without warning, overwhelming his system. If it's the latter, that's not a great sign since it means he likely won't be able to control his reactions, which I could see being very limiting in the future. I worry about how quickly he can go from apparently enjoying himself to full-on meltdown. With Alex, there are signs of the impending apocalypse. Nathan can hit critical in a split second with little to no outward sign. I'm presuming that things build up inside but I can't get him to tell me what it feels like from his perspective. I have no idea what else I could have done and that leaves me feeling like I must be missing something. Lately there's been a lot of talk in my family about an older relative who is well into her nineties and beginning to show signs of dementia. She's always been independent and strong, but increasingly, she needs help with day to day life, which gets doubly frustrating when she can't remember what's happened ten minutes earlier. I'm not getting involved in the debates over what kind of support to set up as I haven't seen this relative for many years and I'm not involved in the day to day management. But in listening to the people who are, something struck me. The issues they're talking about are similar to the ones I'm dealing with. If someone takes her out, she will wander off (her mobility hasn't been impaired, so she's quite quick) but can't remember what city she's in. She needs clearly visible schedules to remember what's going to happen in a given day or else she gets flustered and upset. Caring for her has become like caring for a special needs child, it doesn't matter what you think she "should" be able to do, instead you have to concentrate on what she can actually do and make accommodations. It makes me wonder if the recent increase and understanding of how to deal with autism could have longer reaching effects than we realize. Perhaps many of the techniques we use to help children with autism cope with daily life could be used to help the elderly or those with Alzheimer's. I honestly don't know enough to say whether or not this is an insight or completely misses the point, but it has got me thinking. It's also got me thinking about what could potentially happen as Alex gets older. Dementia does run in some family branches, so what will happen if he loses his mental faculties as he gets older. Given the already challenging situation, it could make finding someone or somewhere to take care of him nearly impossible. It's a long time in the future and I refuse to borrow trouble, but it's one more brooding point to add to the list. I spoke with Alex's teacher on Monday and she let me know that they had concerns about Alex going back to school full time. We've been gradually lengthening the day as therapy finished and on Tuesday, he was due to start full time. Instead, his teacher would like us to continue picking him up an hour before school ends. He's definitely had a lot of trouble with this finish time. When we initially lengthened the day by an hour, he adapted very quickly after two days. With the second hour added, he was still having trouble after two weeks, although it was improving. I can understand the school's decision to delay adding the final hour. It will give Alex more time to adapt and adjust. Of course, it means some trouble on my end. The main issue is that now the therapists have moved on to other clients, so I don't have anyone to help me with Alex. If he comes home and is allowed to basically have free play, I risk inadvertently reinforcing the shorter school day. He's smart and quite capable of self-triggering some tantrums if he thinks it gets him something desirable. I've decided to run errands with him, which he doesn't hate but certainly isn't as fun as playing. The school wants to do this for a week or two, which I'm willing to play along with. After that, though, I'm going to need a new plan. If Alex is coming home early and I have to manage him, that means no writing time for me, which is okay temporarily but not long term. Not to mention the fact that I'm definitely going to run out of errands to take him on. I've also asked the therapists for suggestions for activities to do with Alex which wouldn't be reinforcing. The school is pretty good with him, so when they ask for some extra time, I know it's not a request they make lightly. Something in my gut tells me that Alex is going to continue to have a rough time and we're eventually just going to have to tough out the full day though. We'll see if my instincts are right. The Politics of a "Cure"
When I was speaking at Can-Con last weekend about how autism is portrayed in fiction, I was surprised by the level of antagonism towards any implication of a "cure". One of the panelists, who had Aspergers, got quite upset and compared curing autism with trying to cure being gay. Another said we shouldn't even diagnose autism since the purpose of a diagnosis is to "fix" the problem. I disagree on both points, though I believe I can understand the underlying motivation behind them. It would indeed be beneficial if people and society were more understanding and accepting of different ways of seeing the world. That should be (and is) one of the goals of the autism community, to normalize how people with autism see the world so that it can be accepted as just another point of view. However, there is a substantial difference between those who are able to function and those who aren't. To say that those who need help in order to function in society should not be allowed to have it or even be allowed to self-identify is cruel. It puts politics above individual welfare, saying that the appearance is more important than the reality. To me, there is a big difference between autism and sexual orientation. Autism has hard-wired problems such as sensory issues, difficulty functioning socially and communication challenges. Those things will sharply limit the individual with autism from doing the things they want to do if they don't receive help with how to deal with them. For sexual orientation, the difficulties are external, imposed by society's expectations. In a completely accepting society, the person with severe autism will still have difficulty. And I strongly disagree with the idea that the purpose of a diagnosis is to fix the disorder. It is also to identify what help and accommodations a person needs and help them to find a supportive community of similar people. I've compared autism to a backpack of rocks, weighing my children down and making their life's journey more difficult compared to the rest of the world. To imply that I am somehow not accepting of my children because I don't want them to be hindered by that backpack is just insulting. Any parent, any human, should be outraged and want to help. There are two ways to make that backpack lighter. One is increased acceptance but the other is therapy and the hard work which comes with it. I cannot control society's acceptance, although I can certainly try. But I can certainly put the work in at home. Perhaps one day my sons will look at me and rage about how I forced them to become typical. How I pushed them beyond their natural place and view. If that day comes, it will be hard, but it will also be a secret moment of triumph. Because it will mean they've come far enough to no longer be weighed down by their autism. And that would be a success. This year's Hallowe'en costumes turned out particularly well, I believe. Mr. Nathan was Han Solo. He already had the turtleneck, I made him the vest (including smuggler pockets) and then tightened a set of sweatpants for his pants. I added a "cuff" around his knee for Solo's knee-boots and the red stripe. Nathan really liked his gun belt with the low slung holster. Alex was Super Grover 2.0 (from Sesame Street). That one presented more of a problem. We already had the cape, so that part was simple. I made the pants and top out of blue towels, then the harness and belt out of craft foam sheets. The gloves are regular white knit gloves with the Grover fingers (more towel) on top. The helmet was the hardest part for me to figure out. I used a Kinder suprise egg wrapped in felt for the nose and craft foam for the eyes and mouth. I rolled up towelling to do the "chin" for Alex to look out of. The helmet was all craft foam and while I wasn't entirely happy with it, I think it turned out well. The two of them had a lot of fun. We went trick or treating for half an hour, managing to make it up and down most of our street. Together, they collected a shopping bag full of treats (although I'm sure they won't be eating most of them). It was a nice change from last year's "two houses and we're done" approach. Halfway through, Alex decided he didn't want any more chips, so if someone started to give him a bag, he'd tell them "No chips, please." Dave and Nathan did the decorations since I was away at Can-Con. It's the first year I haven't wholly coordinated Hallowe'en and while I feel a little sad at not getting to participate in everything, I think I hit all the important things. I rushed back for trick or treating and took them out. Dave found these rotating "disco" bulbs for our lights, which turned out to be a big hit in the neighbourhood (although difficult to photograph). It was real easy to spot our house with all the light and motion.